The built-in USB interface and SD card reader make it available to watch your digital movies via USB flash driver or SD card. 1.NOTE: The game socket and the USB jack is not the same, the jack on the back of the unit! please check your disc for it may be stained or damaged. We are so self-confident with our product, so we are ready to offer professional suggestions for you owning to the technical support from our factory and a professional customer service team. Note A: MP4 video standard playback format: DIVX, XVID.File such as MP4 video downloaded from Internet cannot be read may result from higher resolution than 1024 * 800, a wrong format(occur error during conversion, even if it shows the MP4 format). Therefore, you need to convert it again, and please contact me for the format conversion software(resolution or format). Note B: Please check the package, accessories and function of drawer firstly, setup the status and data by SETUP and MODE secondly. The waterproof touch button may too sensitive, so please pay attention not to touch them frequently. If you fail to receive a word file for detailed instructions when you receive the product, please contact us. Note C: The jack for game controller is at the back of the DVD player, and the remote controller cannot control games; if the device cannot play any disc normally, please check the Memory Last function to turn the function off and turn off the DVD Player to try it again. 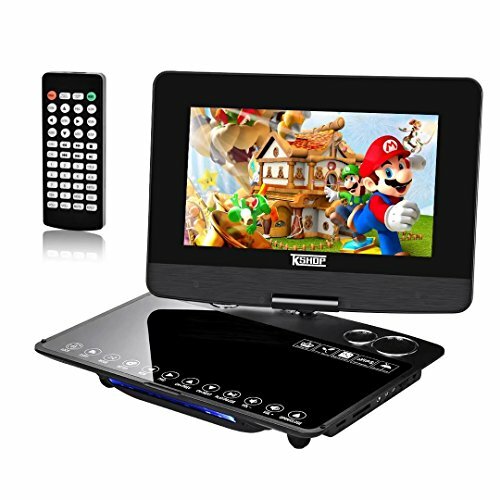 Advanced Design = Waterproof and Dust Proof Button(different from mechanical buttons which may be out of work resulting from water in ) + 270 °and 180 °Swiveling Screen(can be rotated like a tablet to attach to the headrest when driving) + Resolution of 1024 * 800(a high-definition LED screen with clear,stable and smooth imaging results to protect your eyes effectively).